AutoUncle’s rating is based statistics rather than expert judgments and in fact the logic behind the rating is easy to follow. It is all about extracting information about the market prices from the current market. The advert text is analysed for factual information about the car’s year, mileage and equipment. Air conditioning can be written in many different ways and the scanning process accounts for the different variations. In that way, we make sure that important data, which has an impact on the market price calculation, is extracted. The validation is about checking that the collected data values are realistic. For example, the mileage of the car is checked against the car’s age. We also fill out holes in the data - for instance horsepower, which can affect the price calculation. Last step is the calculation of the market price. In this calculation, a statistical comparison between each car and cars that are similar on price, year, mileage and equipment is performed. In total every car is compared on up to a 100 different facts. But how does the calculation of each of the factual information like year, mileage and equipment affect the value of the car? In principle, the AutoScore algorithm does the same as you do, when you are sitting at home behind the screen comparing different cars on price, mileage, equipment etc - the only difference is that here this comparison is done statistically. Imagine that you have 20 cars, which are completely similar - except for three things: price, mileage and air conditioning. In the graph below, you have 10 cars with airc onditioning (blue ones) and 10 without air conditioning (red ones). The graph shows two interesting things. Firstly, there is an association between asking price and mileage. The higher the mileage, the lower the asking price. 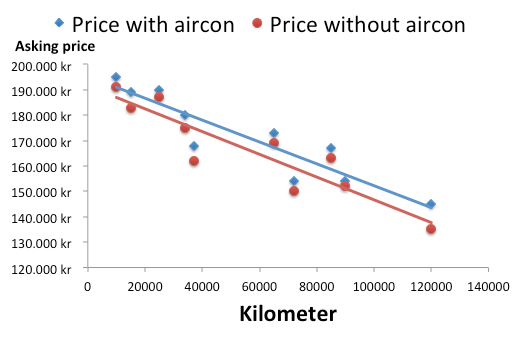 Secondly, we see that cars with air conditioning (blue ones) typically have a higher asking price than the red ones without air conditioning. The difference between the blue and the red line, is the value, that the current market associate with air conditioning. To sum up, AutoUncle’s algorithm works in the exact same way as your own logic you use to compare model, mileage, year and equipment. The only difference is that AutoUncle is able to perform this comparison on so many parameters at the same time and on thousands of cars. Imagine that you had to do this comparison on thousands of cars. AutoScore helps you to do what you are already trying to - namely, to extract the insights about the market price, which the market contains.